Over the last few months, in our conversations with marketing teams that have signed up and are using Brightpod, we’ve realized that there are certain qualities that marketers look for in a project management tool. Marketing teams, actually have slightly different project management needs as compared to say, development teams. There is a huge demand for better collaboration & beautiful, zen software. In this post, I’d like to share with all of you, our learning of what makes a great marketing project management tool & what you should look for when evaluating a tool for your own team. I can forgive you if that was the first thought in your head. Ease of use and simplicity are much touted features in today’s world but they’re especially important for marketers. Why, you ask? Simply because marketers already use a plethora of tools for analytics , blogging, email marketing, SEO, social media etc. and adding a complicated, bulky tool to that list is nobody’s idea of a good time. Key Takeaway: Pick a marketing project management tool that is dead simple and has a negligible learning curve. Your team will thank you for it. Project management tools themselves require a bit of work to be effective. Adding milestones and tasks, assigning tasks to team members etc requires a little diligence. Picking a tool that is a time saver can help with this. 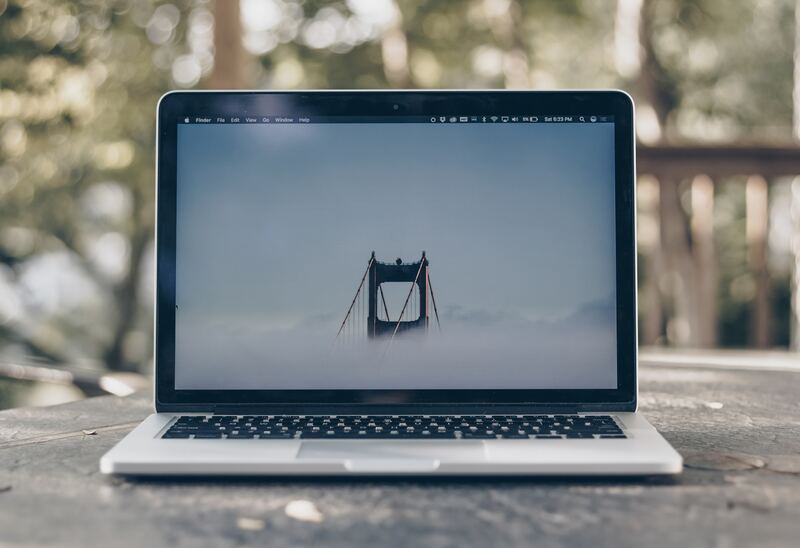 It’s the small things like keyboard shortcuts, easy assigning, automated notifications that help marketers save time and still be organized. 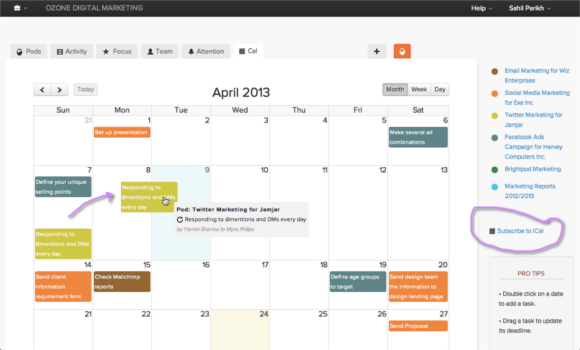 For instance, Brightpod has ready-made marketing workflows that teams can use to plan a new campaign instantly. User can also make their own custom workflows. This is super helpful for agencies that use similar workflows for every new client. Key Takeaway: Explore the time saving abilities of the project management tools you’re evaluating to see which one comes out on top. Marketers have to work through a LOT of repetitive tasks. Whether it’s creating a social media report every month or a client call every week, recurring tasks are an essential part of day to day life. The problem lies in remembering such tasks. Sure, you can add these tasks every week/every month but will you remember to do so? Using a tool that has the functionality to recur tasks makes this aspect so much easier. It essentially remembers for you! Now, who doesn’t love that? Marketing as a function involves a lot of collaboration. Campaigns are usually handled by multiple people and there are often approval processes in place for content as well. Now if you’re scheduling and planning your tasks with one tool, it’s natural to expect that you should be able to collaborate on those tasks using the same tool too. And you SHOULD expect it. The right project management tool for marketing teams will always include collaboration features like messages, comments as well as file sharing features to handle approvals. Key Takeaway: Don’t settle for a tool that doesn’t offer seamless collaboration. Look for messaging, commenting and file-sharing abilities. I’m sure you don’t need me to tell you but Content Marketing is huge! Every marketer worth his/her salt is investing in the content revolution (If you aren’t doing it yet, now is a good time to start!) and there has been a steady rise in tools that help marketers manage this critical function. Every content marketer I know uses an editorial calendar to plan their content and picking a project management tool that comes with one just makes sense. Investing time in finding the tool that does this will not only help reduce the number of tools you use but will also collate all your planning activities into one tool for easy reference. Key Takeaway: Look for a project management tool that comes with an Editorial Calendar (or at least a calendar) to help plan your content marketing activities. Deadlines, clients, campaigns, social media — that’s a lot of noise for marketers to deal with. Although I believe marketers thrive on chaos, it’s certainly essential to zone out and just focus from time to time. Project management tools too, can get chaotic. There are so many tasks, milestones and deadlines floating around that it can get difficult to focus on the important tasks. The ones that absolutely have to get done. Tools that allow tagging as well as have an option to mark important tasks can definitely help here. 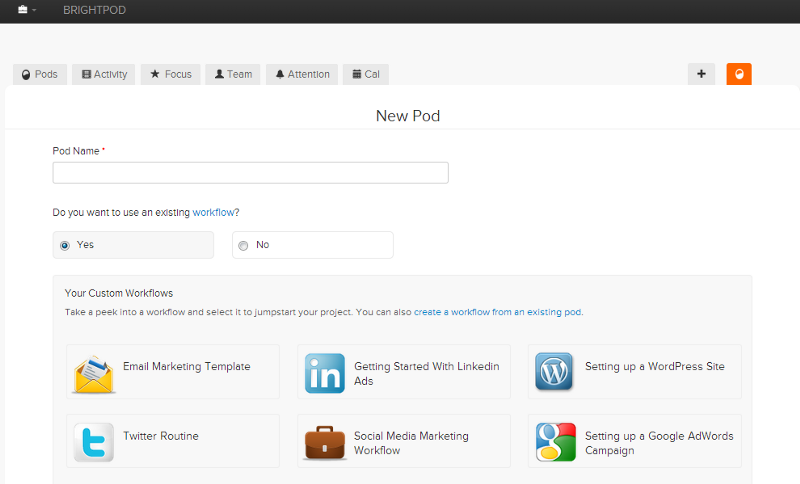 In Brightpod, for example, there is a Focus page dedicated to tasks you want to concentrate on. Then there’s the Attention page that shows just the tasks you’ve got coming up in the next week (as well as the tasks you’ve delegated for next week). To put it simply, it helps you zoom in & see the smaller picture. Key Takeaway: Look for features that will allow you to focus on important tasks and cut out the chaos. Every marketing team has a different makeup. Some teams handle everything in-house, some outsource certain functions to agencies & some employ freelancers. Regardless of your setup, you will have different permission structures for your team. Maybe there are certain activities you don’t need your freelancers to see or certain tasks that only concern team members and not interns. How do you handle that within your project management tool? Your project management tool needs to have different permission levels for different kinds of employees that gives full access to some and limited access to others. Key Takeaway: Choose a project management tool that allows you to involve everyone. From freelancers and team members to agencies and clients. There you go, marketers — The 6 essential qualities of a project management tool for marketing teams.